One of my very good friends, Gene, is a wonderful guy .. a gentleman in every sense of the word. Born in Taiwan, he immigrated to Canada with his family when he was a young boy. We "met" through the internet, an IRC chat room about a fantastic sci-fi/military TV show "Space: Above and Beyond", created by Glen Morgan and James Wong. (The X-Files, Millennium. )(It was SAAB's utter bad luck to be picked up by Fox Entertainment, who utterly FAILED in promoting it, so after only one brilliant season, it left the airwaves. A pox upon Fox Entertainment.). Virtually the entire IRC group met in real life for a get-together in Los Angeles in 1996 and many of us have kept our real life friendships, eventhough we are spread throughout the US. Gene was one of the people that I kept in contact with when the TV show and IRC chat room went dark in 1996. When he moved to the US on a work visa, he became one of the group who already lived in the San Francisco Bay Area. We've all gotten together for social occasions many times since. 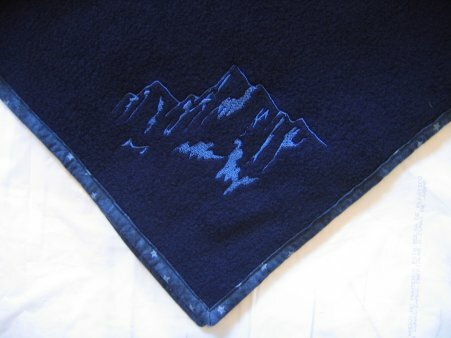 A fully embroidered mountain scene to tie back to his Chinese name. 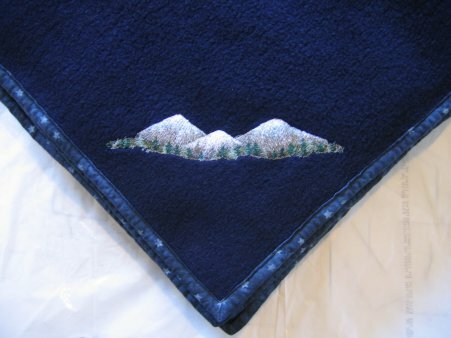 This was the first time I had done such a heavily embroidered design on fleece. 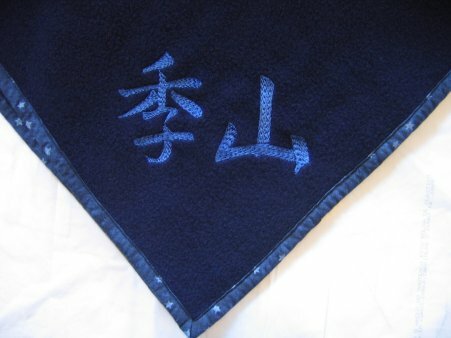 My test stitch-outs weren't good ... the design was so stitch-heavy that the final design curled up. I really didn't like that, so I thought about a solution and came up with one. Using a fibrous, wash-away stabilizer in the hoop, I stitched this design on top of fine bridal tulle. 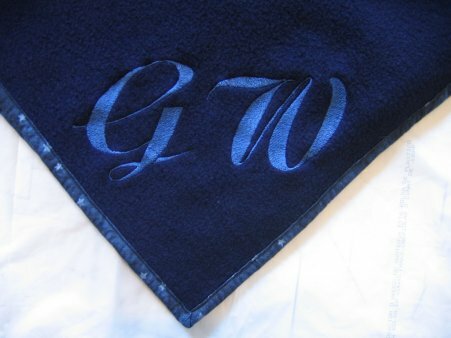 When finished, the tulle and excess stabilizer were cut away and the resultant "free standing" design was then zig-zagged onto the fleece using a very fine micro filament. This worked out wonderfully ... the design is attached to the fleece but sits on top of it.